ASUS X551MAV-EB01-B is a low priced 15.6 inch daily things laptop with modern looks and almost mid-range specs such as a dual core Intel Celeron processor, 4GB memory, 500GB hard drive, an HD display, decent 5 hour battery life and the necessary connectivity ports to give you the power and flexibility you need at home or work for simple daily tasks like internet browsing, spreadsheets, word processing, school assignments, light multimedia and games. 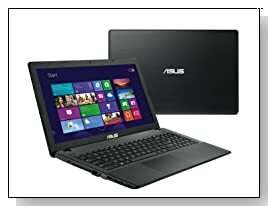 ASUS X551MAV comes with the Intel Celeron N2830 at 2.16GHz base speed, 4GB DDR3 SDRAM memory (1x4GB and the max you can have is 4GB) at 1600 MHz to be able to run a few apps while keeping many internet browsers open with no major lags, 500GB SATA hard drive at 5400rpm rotating speed as ample space of storage at this low price range, for multimedia and regular files and with fast read/write times, 64-bit version of Windows 8.1 operating system which is a step up from the Windows 8 with its additional user friendly functions and as a versatile and safe platform. Released in 2014, Celeron N2830 (Bay Trail-M) is quite an energy efficient entry-level CPU at 7.5 watt thermal design power while not sacrificing performance- significantly better than the Intel Atom processors but you can’t play the most modern games or run demanding complex software comfortably, you’ll be fine with older titles and your usual daily tasks. It doesn’t support hyper threading so it is simply a two core processor but has the turbo boost that takes the speed from 2.16 GHz to 2.41 Ghz when needed but stays at the base speed for usual tasks for less power usage. 15.6 inch non-touch high definition quality display with a max resolution of 1366 x 768 pixels and widescreen support is quite adequate for what the ASUS X551MAV is designed to achieve. Graphics card is the integrated Intel UMA (Unified Memory Architecture) that shares the system RAM as memory and OK for daily use but not for gaming or any video intensive situation. Asus SonicMaster technology offers great immersive sound through the built-in speakers. It has a 101 key US non-backlit keyboard with a built-in multitouch trackpad. The 34WHrs 3-cell lithium ion battery offers approximately 5 hours of battery life on a single charge- this being a highly energy efficient laptop PC. Durable and stylish black ASUS X551 weighs only 4.7 pounds with and measures 15 x 9.9 x 1.2 inches so it is not bad for size and portability as it doesn’t include an optical drive- not many modern day laptops have them these days and no Bluetooth (a USB adapter can be purchased to even a few dollars on Amazon.com but IEEE 802.11 b/g/n for wireless LAN, RJ-45 Ethernet Connector, 1 x USB 2.0 port, 1 x USB 3.0 port, a Combo Headphone/Microphone jack, a VGA port, an HDMI port, a Media Card Reader (SD,MMC) and a webcam with built-in microphone. Conclusion: Asus X551MAV-EB01-B is a fairly slim and light 15.6 inch entry level laptop with specs and features that are more than sufficient for daily computing needs. This is a computer to consider if you’re on a budget and want the most for the limited amount of money you’ll spend. 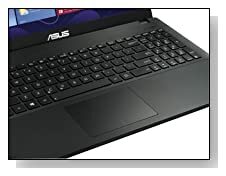 It comes with a 1 year limited parts and labor warranty by Asus, which is one of the top computer manufacturers that is well known for quality products- Asus is definitely a good brand! Sure the X551 has its flaws being such a low-cost machine but you really need to spend at least 2-300 dollars more to just move up to the next level PCs. You have the 2014 model Celeron processor, 4GB RAM, 500GB HDD, a comfy keyboard with 10-key numpad, longer than normal battery life, a USB 3.0 port, an HDMI port and all the other basic but useful connectivity options. Good all round computer for everyday use!